I am late to reading Malala's story. Prior to now I only knew a bit about her story but it turns out there was so much more to know. For those who, like me, only know a bit, here is an overview. Malala's father was the principal of three schools that he started all by himself. He encouraged his children to go to school and to stand up for whatever they believed in - even girls, which was very unusual in Afghanistan. Malala loved school and learning, competing with a friend for the top spot in class each year. But when she was ten her region of Afghanistan that was taken over by the Taliban led by an Iman who preached strict adherence to Sharia law. That meant extreme changes for women who were no longer allowed to go to the market or to school. Malala began to be known as she gave interviews on TV speaking up for the right to go to school. For quite awhile the government of Afghanistan left Malala's region to fend for themselves against the Taliban but eventually the army arrived to help and things returned to normal for a short while. But the Taliban's influence continued to grow. 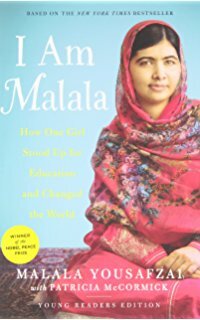 In October 2012 Malala was purposefully targeted on her way home from school when she was shot in the face. Miraculously, she survived and continues her fight for education. Malala's story is amazing and something that needs to be heard by my students who take so much for granted. She is grateful for every day she gets to go to school and for many smaller things that would not even register for most Americans. Her story is one that needs to be heard by everyone so that we can be vigilant against extreme voices that start as something small but eventually lead to widespread oppression. Malala's town did not start out as a Taliban stronghold but people were swayed by a radical voice on the radio to start to take action. Not all of us can be as brave and out there for our beliefs as Malala, but we can all do small things to stop hatred and oppression before it takes root.